Currently browsing posts filed under "Mountain Day"
I will be meeting with finance Ephs at 2:00 in Paresky 201. Stop by and say Hi! Comments Off on Mountain Day Today! 1) This is a great chance for those who want to participate in Mountain Day to do so. Many years, the weather is too iffy to make firm plans. Highly recommended. This year , Mountain Day was dramatically changed, from being a small event held on a Sunday to an official campus-wide celebration. Spearheading the efforts to reinstate the tradition of Mountain Day celebration were Heather Williams a professor of biology, and Bert Leatherman ’00, former College Council co-president. As last year’s chair of the Calendar and Schedule Committee, Williams brought the proposed changes to the rest of the faculty at a faculty meeting. In the April faculty meeting, the Mountain Day proposal sparked a heated debate among the faculty. The faculty members were divided over supporting the proposal until Leatherman stepped forward and helped get the proposal approved.“I think that it would have failed in the Faculty meeting if [Leatherman] hadn’t gotten up and made a speech about how important Mountain Day is,” said Williams. Do any readers remember that debate? Would be great to see the notes from the faculty meeting. One of the major changes made this year was that Mountain Day is no longer scheduled on a set weekend day. Instead, it is a spontaneous celebration announced on a Friday in October. Unsurprising that friend of EphBlog Frank Morgan was on the right side of that debate. As one of the co-leaders of the Hopper Trail hiking trip, Morgan was an active participant in Mountain Day. “To have this chance to be out here today with other faculty and a lot of my students, I think is not only fun but I think is probably one of our more valuable days, too,” added Morgan. 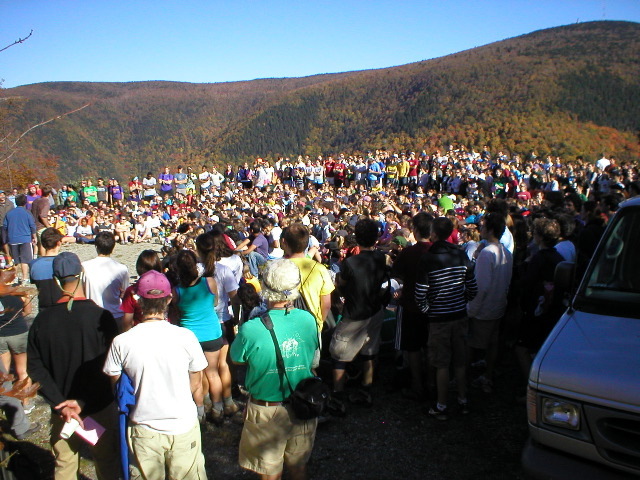 Furthermore, the presence of faculty helped attract students to participate in Mountain Day events. Indeed. I bet memories of Mountain Day are some of the most poignant and important for many of the members of the class of 2001. 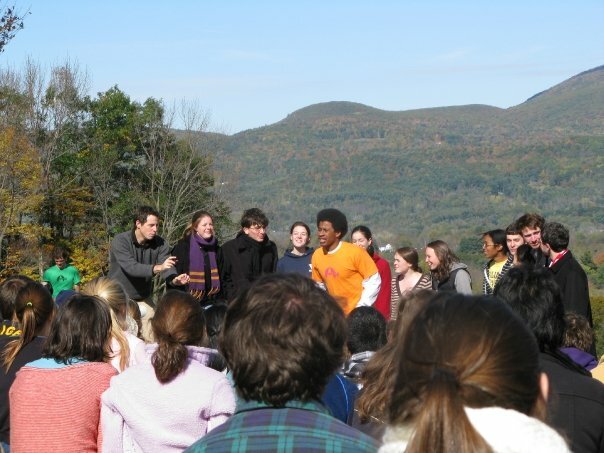 Mountain Day was probably the most important change made by President Schapiro Vogt. What should Adam Falk do? With the success of this year’s Mountain Day celebration, many members of the College community are already looking to next year’s event. Sad that this hasn’t happened yet. Since we all agree that Mountain Day is wonderful, why not a similar day in the spring, one Friday in April? We could easily sacrifice Claiming Williams Day so as to not lose another day of classes . 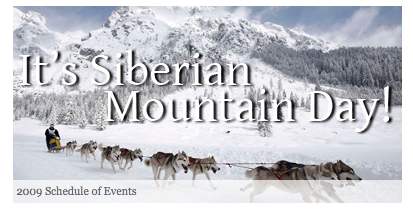 . .
3) Shout out for the Mountain Day miracle of 2009, also known as Siberian Mountain Day, perhaps the event that will be most remembered about Bill Wagner’s interim presidency. For the benefit of future historians, here are the e-mails sent out to announce Mountain Day this fall. The trees on the hills beckon us with their multi-colored glory, with the promise of the sun to warm us. Let’s heed their call. It’s Mountain Day. The mountains are older than all of us. They remind us, through their enduring presence and subtle beauty, that our unity as people is fundamental, far more meaningful than the differences that we sometimes allow to divide us. On this day, particularly as some among us look forward to Eid al-Adha and Yom Kippur beginning this evening, let us cherish, contemplate and embody the values of diversity and deep caring for each other on which our community is founded. And let us do so together, in the embrace of our mountains. 1) Is there are an archive of all the all-campus e-mails that have been sent out? I would hope that the Williams Archives would keep track of such documents (even electronic ones) and make them publicly available. Pointers welcome. 2) Does Adam Falk write these himself? No worries if he does not. Presidents are busy people and he would not be the first or only college president who gets some help with his writing. 3) Either way, “The mountains are older than all of us.” is a nice thought. But maybe a bit tighter? 4) “enduring presence and subtle beauty” is nice phrasing. Agreed! But then why does Williams go to so much trouble to highlight, even to inflame, those differences. Every time that Dean Bolton sends out an all-campus e-mail about silly Halloween costumes, she is telling every Williams student that their “differences” are more important that our similarities. 6) “Eid al-Adha and Yom Kippur beginning this evening” Hmmm. I would wager (corrections welcome) that this is the first Mountain e-mail that includes a reference to Eid al-Adha. a) Given the extremely low percentage of Muslim students at Williams, this seems like a bit of gratuitous PC blather. b) Which religious/cultural holidays will be mentioned in Mountain Day e-mails 20 years from now? c) Don’t think that mentioning Eid al-Adha is laughable? Hmmm. What if I told you that Falk got the date wrong? It began on the evening of Saturday October 4th this fall, not Friday evening. You can always tell a thoughtless pander by the wrong details. 7) “the values of diversity and deep caring for each other on which our community is founded.” More PC blather. If Williams were really “founded” on those values, then it would select its students and faculty using those criteria. We don’t so we aren’t. We choose on the basis of academic talent and ambition, with a little (lot?) of athletics/race/income thrown in for students and race thrown in for professors. 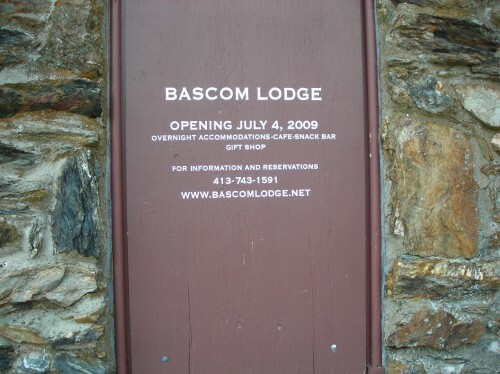 8) If you were President, what would your Mountain Day e-mail be? See below for the details of the day’s events from Scott Lewis. Some things are always worth posting about, regardless of our disagreements and conflicts within the Williams Community. It is absolutely gorgeous in the Purple Valley and I had the honor of ringing the bells this morning to wake folks up. HAPPY MOUNTAIN DAY, wherever you Ephs may be…. Comments Off on HAPPY MOUNTAIN DAY!!!! I’m never trusting forecasts again. The weather today was cool, cloudy, and pleasant when I awoke at 6:30 AM. At 7:30, I saw my first snow of the year, and promptly expected things to go downhill from there. By 10:30, there were bits of blue against the horizon; the snowflakes had long since vanished. By 11:30, clouds and clear skies were interspersed. At 12:30, I had to put on my sunglasses in advance of the Stone Hill trip; students were lounging on Paresky lawn, eating lunch and enjoying each other. The weather at 2:00 on Stone Hill was a wonderful backdrop for the 8 groups who sang; I’m told the seniors who ventured out to Stony Ledge instead had the most beautiful weather they can remember. At 4:47 as I write this, there is not a cloud to be seen in the sky. You can see some low-res Stone Hill photos from Professor Frank Morgan here. Without a doubt, today’s weather was the best yet in October. I didn’t need anything more than a long-sleeved shirt, and Mountain Day was a RESOUNDING SUCCESS. Image: Kyle Martin ’12 performing “Shout” with Good Question. Provided by a GQ member. The Mountains, the mountains Ural invited! It’s really not too cold thus far – I think the sunrise hikers actually had a fairly easy time of it, compared to expectations. However, it should be said that the first snow of the year was observed by this campus correspondent just after the bells rang out to announce the day. I find this to be some combination of poetic justice and irony. Image taken from the Williams Website. Go to the WOC Website for more information about today. General information about Mountain Day’s history is here. A couple of low pressure systems will produce a historic early-season snow event across parts of the Northeast. Rain and wind will also occur in lower elevations. The first low pressure system will begin to move away from the coast early on Friday. Overnight snow will taper off across southern Upstate New York and the mountains/valleys of Pennsylvania as the rain and wind slacken over the rest of the Mid-Atlantic, southeast New York and southern New England. Accumulating wet snow will likely snap trees and power lines across parts of northern and western Pennsylvania. The break in the action will be short-lived as a second storm develops off the Mid-Atlantic Coast this weekend with additional snow, rain and wind, especially across the eastern Mid-Atlantic, eastern New York and much of New England minus northern Maine. In which the full punning force of certain WOC staffers is revealed…..
9:00am-12:00pm Siberian Film Festival in Paresky Auditorium. 10:30 am-12:30 pm Climb High Climb Czar – Open Climbing at the Towne Field House. 11:00 am Baltic Bear Swim!!! Meet at Paresky Steps for a refreshing dip in the Green River. 11:00 am-1:00pm All-Campus Indoor Picnic and Community Gathering in Paresky. 11:30am “Da” tournament – Paresky Steps. 2pm Festivities Begin on Stone Hill!!! Performances by student groups, refreshments provided. Bring a CUPPS cup AND a friend or two, three…. 2:45pm Hike Back to Campus. This is called trying to make the most of a situation that’s far from perfect. The weather forecast for tomorrow reads like one for the Russian steppes. But some faculty have designed their courses with the thought that classes would not be held on one of these three Fridays, and the desire to have some kind of celebration tomorrow runs deep. Therefore I have decided to call tomorrow Siberian Mountain Day — calling on the Outing Club, student leaders, and others to devise ways for there to be safe, communal fun tomorrow, some of it even outdoors. I’m letting you know earlier than usual because so much curricular and other planning depends on this information. Scott Lewis will e-mail you in the morning with a revised schedule of tundra-friendly activities. 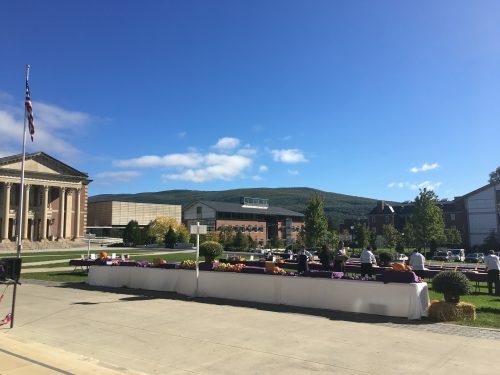 This turn of events raises another set of issues for the Calendar and Schedule Committee to consider in its review of the Mountain Day program, which was already scheduled for this academic year. But for now let’s see how we can make tomorrow memorable despite the challenges. 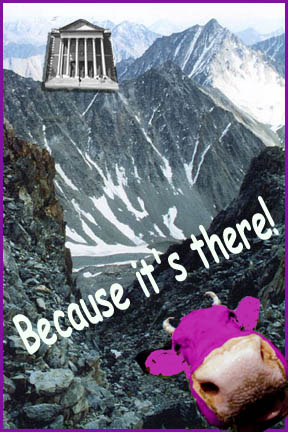 EDIT: Bear in mind that Mountain Day cannot be next weekend – that’s family days, and many parents want to visit class. Furthermore, professors have already scheduled Mountain Day into their calendars – three bad Fridays in a row have never happened since Mountain Day was made spontaneous. I do not agree with any suggestion to push it back further. My idea was just to cancel classes and let students do what they will. I like this compromise much better. SECOND EDIT: Apparently our weather forecast for tomorrow is the same as that for a town in Siberia. Two points to Wagner. What are the “rules” for Mountain Day? For example, I assume not on the Friday of Family Days, but are there other Friday restrictions? There’s a discussion about it on WSO. In the WSO thread above, several students report watching the weather forecast obsessively in an attempt to predict Mountain Day. Mountain Day will be this Friday, obviously. What advice do readers have for first years on the most fun activities for this unique Williams tradition? UPDATE: “Word on the street is it can’t be mountain day on friday cuz Morty is out of town. Thoughts?” Hmmmm. David asked that I re-post an article from my comment yesterday as a new thread, as some aren’t brave enough to read the comments (and I know even fewer follow links). This is a lovely little bit of Williams history, pulled from an 1895 article found online in the now free New York Times Archives. Honestly, the reaches of Google never cease to amaze me. I’ve typed the text of the piece below, but I also recommend that you view the pdf in all of its glory – historic typface and all. Undergraduate Life There Many Years Ago. John Howard Corwin in the American University Magazine. In its early days Williams College approached more nearly to Garfield’s famous definition of an ideal institution of learning — “a log with a student on one end and Dr. Hopkins on the other” — than could possibly be imagined by a visitor to Williamstown in these later times. There was then, in fact, little else to make the college beside the Faculty and very few students. The doctor resigned more than twenty years ago, yet his influence is still strongly felt. My impression of the men I saw and learned to love at Williamstown twenty years ago, in my own and contemporary classes, is that there were very few of them sent through college. No body of associates could, on the whole, have been more serious and earnest than they in the pursuit of all that goes to build up manhood. When the college was in the “log” era it had some peculiar institutions, which have ceased with their causes. One was “Chip Day,” in the Spring when the Faculty allowed a day’s respite from books that the boys might rake up and burn the Winter’s accumulation of chips, which their own sturdy arms had made cutting the wood that burned in students’ stoves. Athletics were not neglected in the days before steam heaters. “Gravel Day” was anciently another local institution — a recess that the boys might gravel the walks about the campus, those who did not work commuting by the payment of a fine, used to pay for the carts and horses. Must turn out and gravel ’em. These useful and healthful days of frolic were merged into “Mountain Day,” now called “Scenery Day,” an opportunity for the athletic pleasure of climbing Greylock and offering sacrifices to the nymphs of the Hoosac and the hills. In these degenerate days, students actually drive to the top of Greylock. Ichabod! Nothing remains to ruin it but a hotel at the summit. It used to offer a grand climb through an almost pathless forest. It needed sturdy legs and good lungs to reach the summit. Sweet was the sleep on pine boughs on that breezy top in a shelter of green branches. 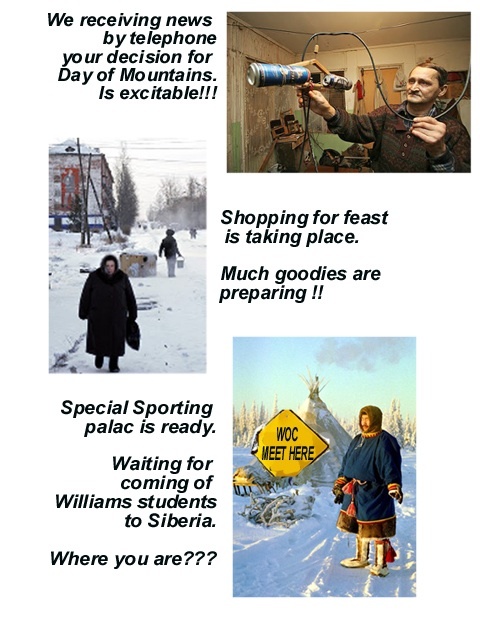 “Mountain Day” is still a Williams Institution. I have heard Martin I. Townsend say that Williamstown had an air to make a man feel like eating a whole ox, and the sturdy old gentleman looked when he said it as if could do it. Old fellows who chopped their own wood, graveled their own roads, cleaned up the campus and climbed mountains insist that the ancient athletics were far superior to the new in physical, mental, and moral results; that they distracted the students less from the serious work for which men are supposed to go to college; that they were far cheaper than “Weston Field” and the Laselle gymnasium. They insist it is better to swing the axe than throw the hammer; better to climb a mountain and get somewhere than trot on a cinder track that returns to the starting point. Yet it may be these old fellows played “three old cat” and cricket and a mild football in which they kicked the ball and not each other. There is further discussion in the comments section of David’s original post for anyone who wants to know more. And another bit of Williams history, this time an article from 1854 that recounts a whole host of strange and interesting Williams traditions with their appropriate timing (among them Gravel Day in the Fall, Chip Day in the Spring, and Mountain Day in the Summer). This is amazing stuff. I don’t have the time to type the text of this one into the post, but please check it out! The brief overview: there were events that sound like the precursors to Ivy Exercises – class marshall organized fun events ending at East College; the possible originator of Light Night – evening presentations after the baccalaureate address called “Moonlight Exhibition.” I will admit it gave me chills to see who the speaker was that year – Ralph Waldo Emerson. I could spend far too much time mucking around in the online archive of the NYT. I will follow up perhaps next week with a post about the mysterious mention at the beginning of the 1854 article of a recent “periodical story so discreditable to Williams.” That the internal workings of Williams were worthy of the Times is pretty cool. Back in the 1980s, there may have been an official Mountain Day, but it was a pale and pathetic imitation of the glorious tradition we now have. Only a small percentage of students participated, the day itself was scheduled in advance (regardless of weather) and always fell on a week-end. (I can’t remember if it was a Saturday or Sunday.) Classes were definitely not canceled. See our coverage of this year’s event along with a nice page from the College. Question: When did Mountain Day change? In particular, what was the first year that classes were canceled and that the day was a “surprise,” picked on the basis of the weather? And who deserves credit for all of this excellence? E-mail from President Schapiro below. Subject: Today is Mountain Day!! Today is Mountain Day! It’s a day for our community. All classes are cancelled. Get outside, meet new people, and make the most of it! Visit http://wso.williams.edu/orgs/woc to see the list of hikes and on-campus events. Come join us on Stone Hilll for the 1st major event of the day, hike leaves from Chapin Steps at 10:00am – refreshments and joyous singing! Community picnic begins at 11:00 a.m. on Chapin Lawn, all are welcomed. hikes for Stony ledge on Mt.Greylock, leave from Chapin lawn at 12:30. Busses will transport to the various trailheads. PLEASE remember there is NO transportation to stony ledge. All hikers will be expected to hike up AND down to the waiting busses at Haley Farm. Busses begin returning to campus at 4:15pm. TURN OFF YOUR CELL PHONES – BE IN THE MOMENT! 1) Who gets credit for Mountain Day? I am embarrassed to have not solved this mystery yet. Twenty years ago, there was a Mountain Day, but it did not involve canceled classes. Whose idea was that and how did they get the faculty to agree? 2) I prefer a little snotty intellectual snobbery with my Pine Cobble hike. Carpe diem, not “seize the day.” Related post here. 3) No one predicted 20 years ago that a Williams president would need to tell students to turn off their cell phones. What unimaginable request will be made 20 years from now? Turn of your . . .
4) Although being in the moment is nice, it would be great to see lots of pictures from Mountain Day, even video of the events. The more that high schoolers around the world know about this cool tradition, the more likely they are to choose Williams. 1) Readers should submit their stories and observations in the comments below. Many Ephs who are too far away from Williamstown would like to live vicariously through you. 2) Many pictures will be taken and posted today. Please provide links in the comments. 3) Carpe diem and falling in love are recurring themes at EphBlog. Today is a good day for both. Some traditions die naturally when people move beyond them, as the house system did when students decided that it was a bad idea. Some traditions, like Mountain Day, are so tied into the spirit and uniqueness of a place and a people that they last for generations. The job of the administration is not to plant new traditions, but to insure an environment amenable to all sorts of human behavior, because both diversity and unity occur in surprising ways. The spirit is right but the facts are wrong. As best I know, Mountain Day was not that meaningful a tradition prior to the 1990’s. Classes were not cancelled. A cappella groups did not sing on the top of Pine Cobble. Large numbers of students did not go hiking. I believe all those things happen today. So, kudos to whoever started this tradition, whoever recognized that it was worthwhile to sacrifice some academics in order to build a better community and celebrate the wonder that is the Berkshires. Does anyone know the story of how Mountain Day became the great event that it is today? EphBlog is powered by WordPress and delivered to you in 1.478 seconds using 61 queries..